The Master of Education (M.Ed.) with emphasis in Elementary Education enhances excellence in teaching by encouraging individual growth and application of research-based techniques and emerging theory in the classroom. In addition, the program builds on basic-level preparation that teachers have received and requires more in-depth study, reading, research, and sharing with classmates in a professional, collegial, academic setting. Candidates for the Master of Education with Elementary Education emphasis complete a 30 hour program, 45 clock hours of field-based learning opportunities, and successful completion of a written comprehensive examination. The program includes three foundation courses, two electives and 15 hours in a language arts/reading or math/science emphasis area. M.Ed. graduates are professionals committed to becoming master teachers who facilitate learning by modeling appropriate practices based on research and emerging theory. As a result of their experiences in the program, interactions with colleagues and faculty, and continued study, they think reflectively about classroom practice and ways to enhance it. An online M.Ed. 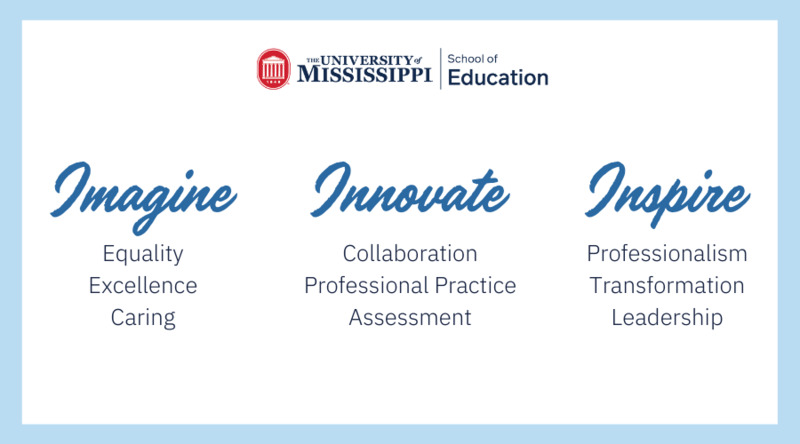 program in Elementary Education is also offered by The University of Mississippi School of Education. Classes for the M.Ed. with Elementary Education emphasis are offered at all of the regional campuses with opportunities for advising at these sites.